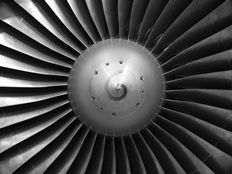 Ni-base superalloys, grown from single crystals, have been developed to meet stringent demands in the hot sections of modern gas turbine engines. These turbine blades require a thermal barrier coating (TBC) to provide adequate insulation. The TBC comprises an yttria-stabilised zirconia (YSZ) top coat and a Pt-diffused bond coat which aids adhesion of the YSZ to the superalloy substrate. Sulphur, which is present at low ppm levels in the Ni-base alloy, is known to segregate during thermal cycling and may accelerate cavity formation with the potential to compromise long-term engine performance. Lucideon was approached by Rolls-Royce to assess quantitative changes in sulphur concentration across the microstructure of a turbine blade material which had been subjected to a series of treatments including high temperature ageing and oxidation cycles. Lucideon utilised its expertise in Secondary Ion Mass Spectrometry (SIMS) to develop a bespoke method to examine the in-depth distribution of sulphur and other key elements including Pt, Cr and Al across the near-surface microstructure using cross-sectional imaging of the treated turbine blade materials. Retrospective linescans from the image data allowed quantitative comparison of the effects of treatments on sulphur segregation through the top coat / bond coat / substrate structure1. The SIMS method successfully monitored the in-depth distribution of key alloying elements and trace elements i.e. sulphur, within Ni-base superalloys. It clearly identified areas of sulphur partitioning within the structure and the effects of thermal cycling on this process. This study helped Rolls-Royce to increase its current understanding of sulphur’s role in the failure mechanisms of TBC’s along with the potential to investigate ways to reduce failures in the TBC structure.